Earlier in the year I spent a week with the Frasca learning about how to be a Sommelier. This week Bobby Stuckey was gracious enough to let me come back and watch them in their pasta making glory. I spent a few hours with Sean who showed me how to cut pappardelle, how to make ravioli dough and how to make gnocchi (one of my favorites). He made it all look effortless but also confided he’s been doing it awhile so he has it down to a science, or I should say, an art. Pappardelle is one of my favorite pastas. We’ll actually be trying to make it tonight. It was great to see how Sean handled it & cut it. Getting started with pasta, it can be hard to figure out how to handle it & how dry/wet it should be. He was pretty generous with dusting it with semolina to keep it from sticking. He said it’s important to keep its “toothiness”. The pasta was a beautiful golden color. In a matter of minutes he had cut a gorgeous tray full of pappardelle. After showing me how to make their ravioli pasta, Sean moved onto the gnocchi. I’ve always heard it can be hard to make and touchy because of the consistency of the potatoes. Sean said his first few attempts weren’t his best but now it’s second hand. 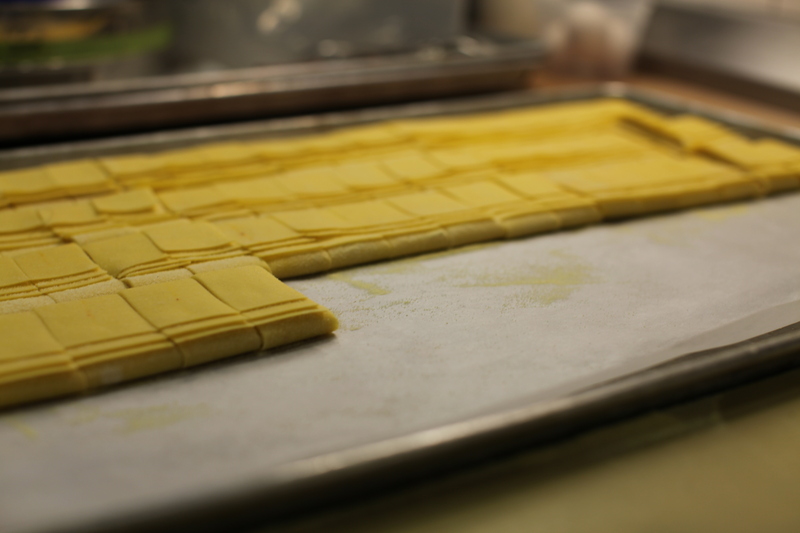 One thing about pasta is that it does come from the simplest of ingredients. 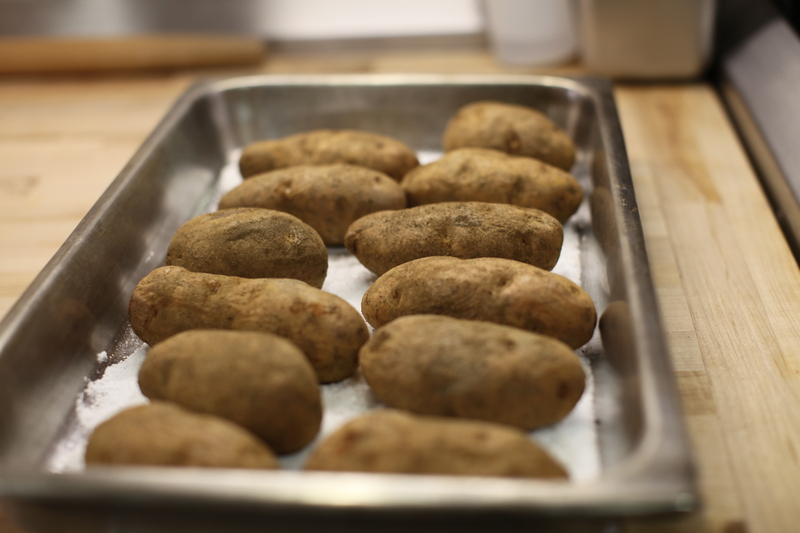 With gnocchi you start with a good old baked potato. They bake them in a bed of sea salt to help with moisture. With gnocchi Sean said it’s important to get the right consistency with the potatoes so he uses a food mill to make the potato uniform in size. 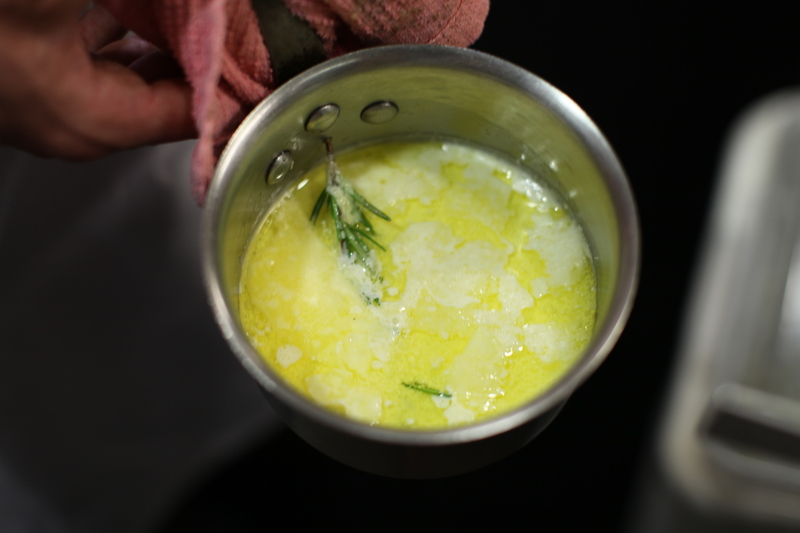 He couldn’t share their recipe secrets, but one he did share they include is rosemary infused butter and cream which makes the gnocchi have a rich texture and wonderful fragrance. It smelled amazing. After adding the remaining ingredients he gently mixed the dough on a well floured board. He didn’t fuss with it too much. 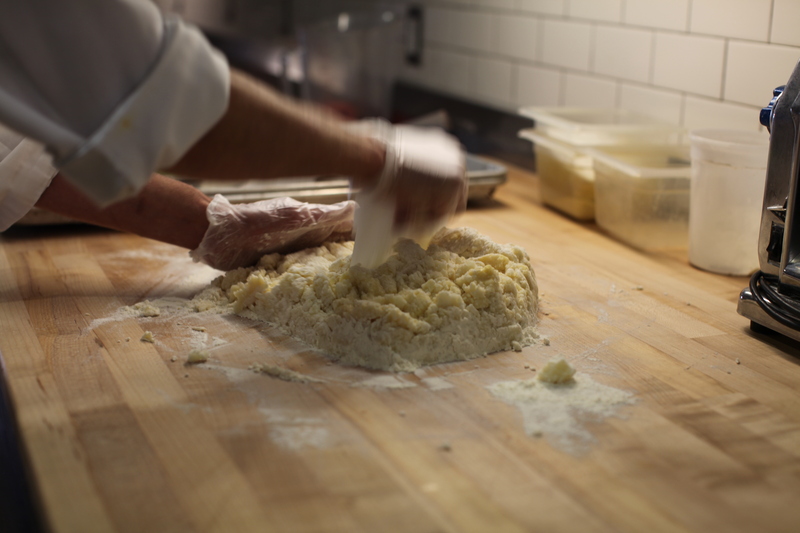 Then the mesmerizing gnocchi production began. 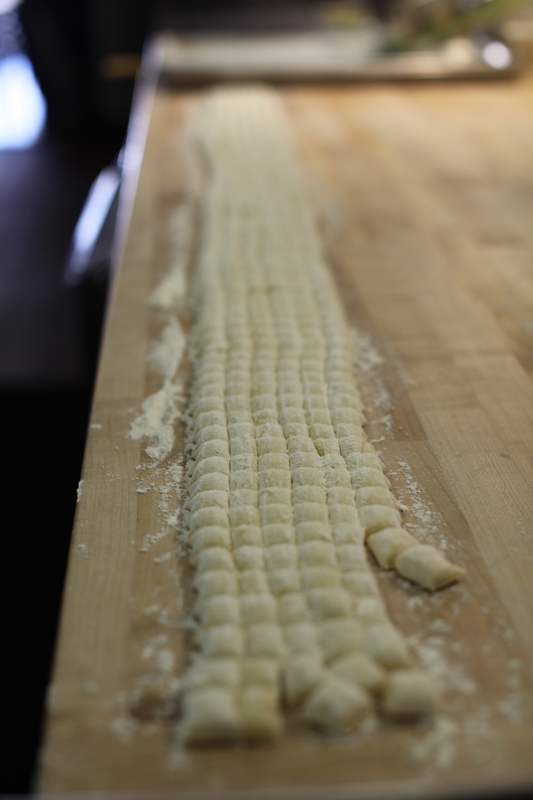 He piped out 5 long rolls of gnocchi across a huge cutting board surface which made me contemplate a kitchen remodel. Again it was well floured. I’m glad I got to see this because I would probably have been much more worried about how much flour I was using. Sean then masterfully cut them into perfectly uniform little pillows which would later be hand formed one by one. Sean then sifted out a bit of the flour and voila! I was pretty hungry at that point since it was lunchtime and I love gnocchi. The raw dough smelled amazing. Luckily my parents were in town this weekend so we paid Frasca a visit on Friday night to enjoy their tasting menu. As a surprise they brought us an extra course of their gnocchi which were incredible. I still have a few pastas to try before I feel brave enough to make gnocchi but I was definitely inspired by watching Sean make some of the best gnocchi I’ve ever had. You are currently reading Inspired by Frasca Food & Wine at 52 To Do.